On Monday, April 22, a delegation of MSEA-SEIU members delivered our letter with over 2,000 signatures to Governor Mills asking her to address the serious recruitment and retention problem throughout Maine State Government and to end publicly funded low-wage work. Thank you to all who signed our letter. We still await a response from the administration to our Executive Branch Bargaining Team’s wage proposal. More photos here. In bargaining on March 18 the team made clear that to settle a fair contract the state must address three key issues: we must recruit new workers, value and retain experienced workers and make state service the kind of work that allows state workers families to thrive not just survive. Additional steps – to update our outdated pay scale so we can retain workers and reward service. Pay rate increases across the board – that end publicly funded low wage work. State Government shouldn’t be in the business of lowering wages or labor standards. Maintenance, construction, and administrative workers must share in the prosperity that their labor creates. No state worker should have to rely on SNAP to care for their families or work a second job to pay for their housing and health care. Significant across the board cost of living increases – We need to make sure that we are able to recruit skilled workers and not losing trained workers to private and public employers who offer higher wages. 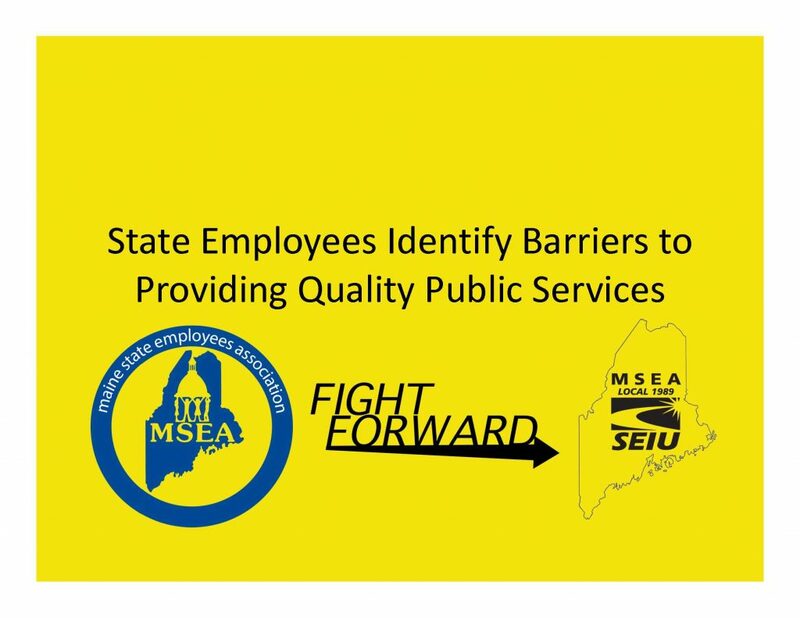 Now that we have made the demand at the table and are waiting for management’s response – we need your support to show the state that state workers everywhere support these demands. Share the link with your co-workers, family and friends. Whether you are currently a union member or not this will affect you and the state needs to see we all demand respect! Address understaffing, workloads, healthcare, pay! 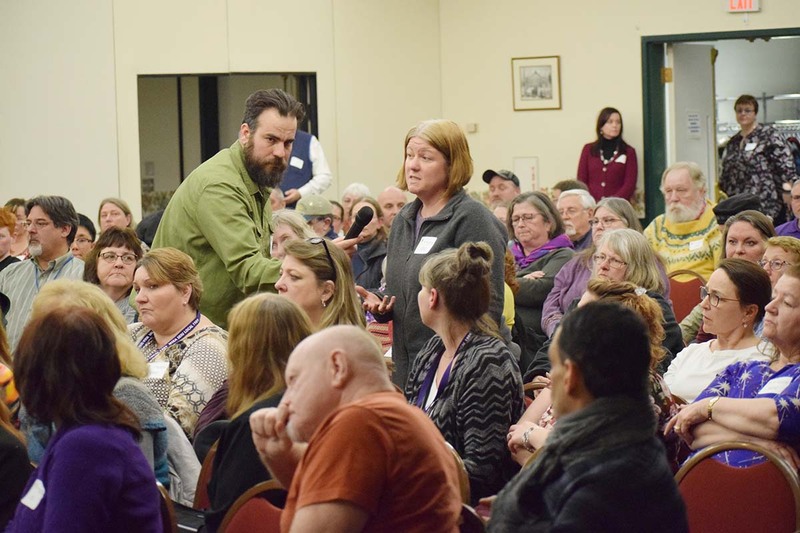 Nearly 200 MSEA-SEIU members and guests spoke directly with Governor Janet Mills on Feb. 20 about problems they’re experiencing in delivering quality services to Maine people. From wages to DHHS staffing to rising healthcare costs to retirement insecurity, members asked the Governor to work with them in finding solutions. Story here. Contract bargaining has begun. Click here for updates and TAKE ACTION in support of the bargaining team! 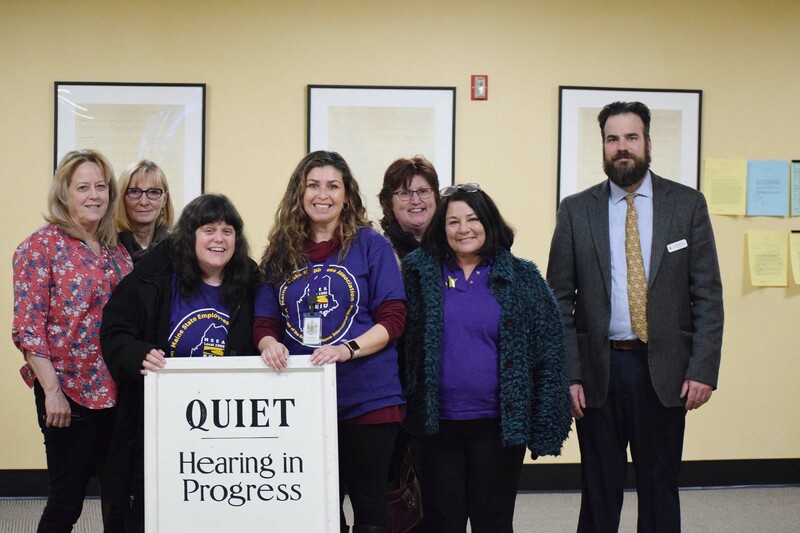 MSEA-SEIU members who work as Adult Protective Caseworkers at Maine DHHS testified Feb. 27, on their own time and as private citizens, before the Maine Legislature’s Health and Human Services Committee in support of legislation ensuring wage equity among Maine DHHS caseworkers. Story. There’s a whole lot of bargaining going on! Photos, stories here. The State of Maine’s wage compensation system for Executive Branch employees has never been updated in a comprehensive, meaningful way since its implementation in the 1970s. It needs to be brought into the 21st century, in line with market wages, in order for the State of Maine to recruit and retain qualified employees. It’s time for a Compensation Study. We are supporting legislation titled Resolve, To Conduct a Comprehensive Study of the Compensation System for State Employees, introduced by Senate President Troy Jackson and currently known as LR 1585. Take action! Quality services for Maine people have been understaffed and underfunded for the past 10 years. Many of you have identified real barriers in delivering services such as protecting the public health, protecting vulnerable children and adults, maintaining Maine’s highways and bridges, and even answering 911 calls. With so many public services at stake, we’re encouraged the Governor’s proposed two-year state budget takes some important steps toward finally getting public services back on track. It’s a starting point for quality services. 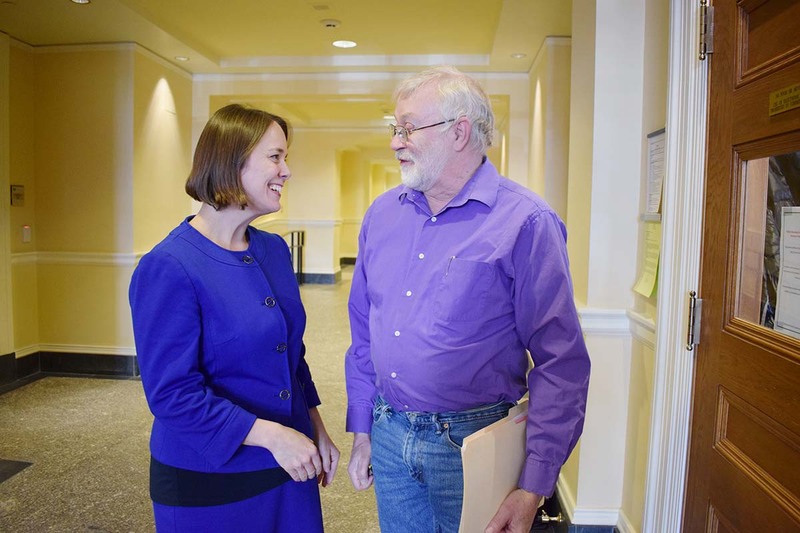 MSEA-SEIU Retiree Member Hal Booth thanks his State Senator, Shenna Bellows, for sponsoring LD 162, An Act to Eliminate the State Income Tax on Maine Public Employees Retirement System Pensions. The Maine Legislature is working on the next two-year state budget and considering legislation directly impacting you and the quality services Maine people count on. It’s up to all of us to alert our state senators and state representatives to issues like understaffing, retirement security, the shortage of MDOT workers, the need for a Compensation Study, the need to protect taxpayers against costly and inefficient contracting out, the need to strengthen courthouse safety and to ensure pay equity for DHHS caseworkers, the need for a prerelease center in Washington County, and the need for paid sick days. Story. Members of the 2019 MSEA-SEIU Board of Directors gathered Jan. 12 to strategize for working families and retirees. From left: MSEA-SEIU Secretary Kathy Ferrick, Director Allison Perkins, Director Tom Maher, Director Paul Edgecomb, Director Tracy Bonnevie, MSEA-SEIU Treasurer Mark Landry, Director Jen Neumeyer, Director Maureen Sullivan, MSEA-SEIU President Ramona Welton, Director Phil Garwood, MSEA-SEIU Vice President Dean Staffieri, Director Dave Projansky, Director Jason Mitchell, Director Steve Kimball, Director Lisa Morgan, Director Cal Paquet, Retiree Director Paul Gilbert, Alternate Retiree Director Diane Sharpe, and Retiree Director Bob Ruhlin. Since this photo was taken, Ginette Rivard was elected as a Retiree Alternate Director. Apply now for 2019 MSEA-SEIU scholarships! Info and applications here! MSEA-SEIU Stewards: Mark your calendars! Statewide Steward Skills Training, Monday, April 22, Augusta Civic Center! The MSEA-SEIU Retirees Steering Committee will present our 7th Annual MSEA-SEIU Lifetime Achievement Award to one of our retiree members during our 32nd Annual MSEA-SEIU Retirees Day on Tuesday, May 28, at Augusta Civic Center. Story. 2-page Nomination Form to print out and mail in. Members of the MSEA-SEIU Retirees Steering Committee include, from left, seated: Ginette Rivard, Chair, Peggy Rice, Bob Galloupe, Lois Baxter, Nancy Henry, Mary Oullette and Paul Gilbert; and standing: Bob Ruhlin, Monique Gendron, Mary Peabody, Sharon Labbe, Lewis Prescott, Ben Conant, Steve Butterfield and Junior Tardiff. Committee members scheduled the 32nd Annual MSEA-SEIU Retirees Day for Tuesday, May 28, at Augusta Civic Center. So far, confirmed speakers include Congressman Jared Golden and Maine Attorney General Aaron Frey. Throughout our bargaining units small and large, MSEA-SEIU members and nonmembers identified common themes after a decade of understaffing and underfunding public services: workloads, understaffing, recruitment and retention, making ends meet, and retirement. Read President Welton’s column here.